I’m not a big fan of web-based petitions. They’re generally pretty worthless when it comes to actually getting things done, but they also make participation really, really easy. So, in the spirit of supporting the federal recognition of Darwin Day in the United States, I signed this petition put forth by the International Darwin Day Foundation. As an American who values scientific inquiry and integrity, I urge you to issue a presidential proclamation recognizing Darwin Day on February 12. Darwin Day is celebrated every year on the anniversary of Charles Darwinâ€™s birthday in 1809, and is a day in which people gather together to commemorate his life and work. Charles Darwin was the first to propose the groundbreaking scientific theory of evolution by natural selectionâ€”a theory that has done more to unify and bring understanding to the life sciences than any otherâ€”and Darwin Day is a celebration of this discovery and of scientific progress. I believe that issuing this proclamation will send a powerful message that scientific discovery and integrity in our society are top prioritiesâ€”priorities that are needed now more than ever as extremists with narrow ideological agendas are attempting to undermine science in our schools. Feel free to jump on that bandwagon. Just a quick post to suggest a fantastic program. I watched this and was mezmorized. The last episode of NOVA (on PBS) was called, “What Darwin Never Knew”.Â It delved into the genetics that Darwin could never have been aware of, yet reinforced his theories. The program illustrated just how brilliant Darwin’s theories were, considering he had no access to modern genetic research. 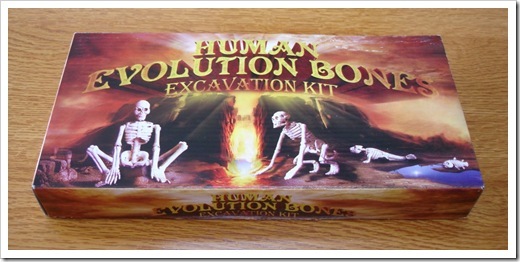 Human Evolution Bones at Five Below! Saturday evening, I was at Five Below with my daughter, shopping for a Christmas gift for a gift exchange (we got a lava lamp, in case you’re wondering) and came upon this little gem. I was amazed. I’d never seen any kind of evolution “toy” before other than the great stuff from Charlie’s Playhouse, but here was something at Five Below, of all places! It’s one of those archaeology, “dig out the treasure” types of toys. 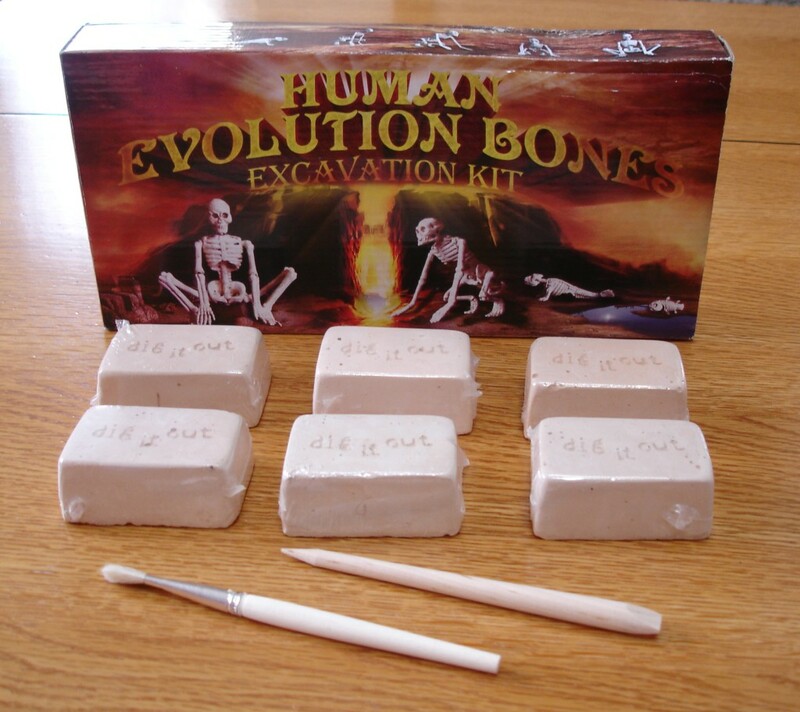 I’ve gotten them before with pirate coins and “Egyptian statues” and some other goodies, but seeing something with the words “Human Evolution” on the front was a bit of a shock… a pleasant one, but a shock nonetheless! Here’s what’s on the box and what’s in the kit. There’s supposed to be model glue in the kit as well, but it wasn’t in the one I photographed. I bought three of them (they were priced at $3.50) so I could give one as a gift and have a spare for myself. Interestingly enough, there were plenty of them on the shelf. I’m not sure if that’s significant or not, since Five Below usually has a lot of everything. Maybe I’ll go back in a few days and see if they’re selling or not. I have trouble seeing this as a big seller, though it would probably sell better here than it would in the bible belt. If you’re in a highly religious area and have a Five Below in your area, check it out and let me know if your store has them. In the meantime, my daughter is anxious to start digging. 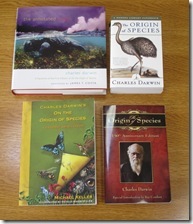 I added Ray Comfort’s edition of Darwin’s book to my collection yesterday. The font of his edition is intolerably small… except for his vacuous introduction, which is in a normal, easy to read font size. The phrase “by the Creator” does not appear in the first edition, nor does it appear in Comfort’s version, so he must have chosen the first edition to bastardize with his introduction. I suspect, though this is pure speculation, that he chose the first edition because it has fewer words… thereby making his giveaway edition cheaper to produce. So Comfort adds his silly introduction… partly plagiarization, partly invalid creationist propaganda, and partly nonsensical proselytizing… but he does choose the first edition to distribute. …which is better for the rest of us. I’m hanging out at Borders this morning while waiting to pick up my daughter after a class she’s taking. I grabbed a copy of The Annotated Origin and Charles Darwin’s On the Origin of Species – A Graphic Adaptation (like a graphic novel version of OTOOS) and am sipping on some coffee while hooked up to free wifi. It’s a good morning. This isn’t my “home” Borders, so I went to the religion section to check out what they had to offer and to see how different it was from the Borders I normally frequent. This religion section is smaller, but had a nicer selection of atheist books. I did crack myself up when I noticed a section that was labeled “Christian Fiction” and thought to myself, Doesn’t that apply to this entire section? I also saw a copy of Evolution for Dummies and considered (briefly) buying it and mailing it to Ray Comfort, but I figured that even a dumbed down version wouldn’t really help Ray… or Kirk, for that matter. On another note, a friend of mine picked up a copy of Comfort and Cameron’s version of On the Origin of Species and is dropping it off at my house today. It’ll be like the proverbial red-headed stepchild. 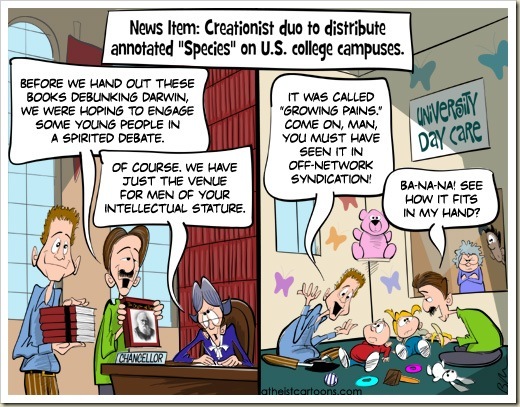 In recognition of the “Origin of Species” giveaway promoted by Ray Comfort and Kirk Cameron, Atheist Cartoons has put up this little gem so I thought I’d share it. If you get a chance (and can stomach it), read the introduction (pdf) that Ray Comfort has written for the book. It’s got the standard creationist nonsense with Comfort’s simple-minded proselytizing. Ray Comfort and Charles Darwin! 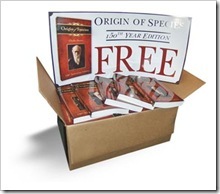 It seems that Kirk Cameron and Ray Comfort have decided that they want to get in on the celebrations of the 150th anniversary of the publication of Darwin’s On the Origin of Species by giving away free copies of the book to college students. While that seems both generous and out of character, it turns out that it is neither. They’re printing a special version of the book with a fifty-page introduction written by Comfort which “reveals the dangerous fruit of evolution.” They aren’t really giving the book away. Comfort’s Living Waters ministry is providing the books for a very low cost to churches or individuals who want to help. Those folks get to give the books away. Now, to be fair, they’re selling the book for as low as 99 cents a copy (if you buy forty or more), so it’s close to a giveaway. Their special version also has an incorrect title. There are a couple problems that I see here. First, it’s telling that they want to “trick” people into getting their gospel message. I suspect they know that they wouldn’t be able to attract those godless students with fifty thousand free copies of a Ray Comfort book. They have to give away a very famous book on evolutionary theory… and then they tuck away their message in the beginning of the book, decrying the book’s contents (but failing miserably). The second problem is that the message itself is absurd. 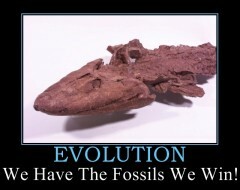 Comfort and Cameron have repeatedly proven that they have absolutely no knowledge of evolutionary theory. Not only do they have no knowledge, but they’ve demonstrated willful ignorance at every turn, using the same, tired objections that have long-since died an unspectacular death by debunking. Cameron’s famous crocoduck comes to mind. Whatever shred of credibility they may have once had (if ever) vanished long, long ago. Here’s an excerpt from the website about what’s in the introduction. This introduction gives the history of evolution, a timeline of Darwinâ€™s life, Hitlerâ€™s undeniable connections to the theory, Darwinâ€™s racism, his disdain for women, and his thoughts on the existence of God. It lists the theoryâ€™s many hoaxes, exposes the unscientific belief that nothing created everything, points to the incredible structure of DNA, and the absence of any species-to-species transitional forms. Comfort always seems to bring up the “nothing created everything” argument when discussing evolution. He also repeats his “no transitional forms” argument. It almost sounds as if he doesn’t understand evolutionary theory. I’m never sure if he really is that actively and willfully ignorant or if he really does know that his points are absurd, but he’s got nowhere else to go. You can read the full fifty-page introduction here (pdf). After a brief history lesson, Comfort starts right into his default “a building must have a builder” shtick. The DNA segment shows a complete lack of understanding of natural selection. It gets worse from there and becomes a cornucopia of monstrous ignorance. Kirk Cameron also narrates a video (also embedded below) which explains the program. I transcribed it so you can read the text of the video if you can’t watch. It’s also full of nonsense. Cameron disqualifies himself right at the beginning when he states “Our kids can no longer pray in public.” Ummm… what? They most certainly can pray in public. They can even pray in public schools. But Cameron has to start off with a message portraying the horrifying state in which we find ourselves. Our kids can’t pray, they can’t open bibles in school, the Ten Commandments can’t be displayed in public places… all nonsense. But then he gets to the really horrifying stuff. In a survey of fifty universities in the United States, sixty-one percent of professors in psychology and biology identified themselves as atheists or agnostics. The horror! I would have thought it would be higher. He doesn’t mention professors of physics, chemistry, sociology, math, or history, though. I found that a bit odd. When explaining the book giveaway, he says that they just want to “present the opposing and correct view.” Seriously? the “correct” view? He continues with the mind-numbing “both sides of the argument” plea, again showing that his understanding of what does and does not constitute “science” is lacking… or non-existent. The main point is that they want to give away these books to university students and they need your help. There’s a Facebook group that was created to thwart Comfort and Cameron’s shenanigans. The idea is to get your hands on as many books as you can, remove the 50-page introduction, thus restoring the book to its original form, and then re-giving them away at the same university. There’s no mention on the Living Waters site about which universities are included, so you’ll have to just pay your local one a visit on November 19th to check. They don’t sound like they’re really targeting fifty specific universities, though. They don’t seem that organized. Anyone can order the books and give them away wherever they want, it seems. You even get a free poster with your order. …and fifty pages of nauseating woo and ignorance. Here’s the video. Below is the transcript. Are you concerned about what’s happening to our country? One by one, we’re being stripped of our God-given liberties. 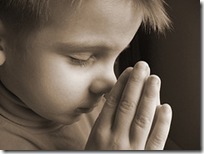 Our kids can no longer pray in public. They can no longer freely open a bible in school. The Ten Commandments are no longer allowed to be displayed in public places and the Gideons are not even allowed to give away bibles in schools. Did you know that a recent study revealed that in the top fifty universities in our country, in the fields of psychology and biology, sixty-one percent of the professors described themselves as atheists or agnostics. That’s sixty-one percent. 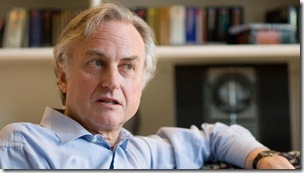 No wonder atheism has doubled in the last twenty years among nineteen to twenty-five year olds. An entire generation is being brainwashed by atheistic evolution without even hearing the alternative and it’s radically changing the culture of our nation. There’s only one way to change the heart of a nation and that is to change the sinful heart of the individual and that’s through he power of the Gospel. Only God can take the sinful heart of a man or a woman and cause them to love that which is right and just and good. Now listen to this. 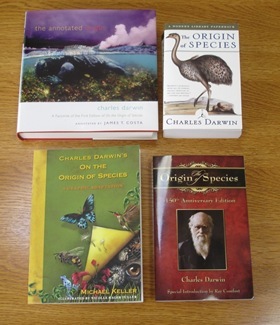 On November 21st, 2009, the world will celebrate the 150th year since the publication of Charles Darwin’s book Origin of Species. Now when my friend Ray Comfort heard about this and that the book was public domain, he actually wrote a fifty page introduction for the book which gives the history of evolution, a timeline of Darwin’s life, Adolf Hitler’s undeniable connection with the theory, Darwin’s racism, his disdain for women, and Darwin’s thoughts on the existence of God and put them in the book. It also lists the theory’s many hoaxes. It exposes the unscientific belief that nothing created everything. It points to the incredible structure of DNA and the absence of any species-to-species transitional forms actually found in the fossil record. It then presents a balanced view of creationism with information from scientists who actually believe that God created the universe, such as Albert Einstein, Isaac Newton, Copernicus, Bacon, Faraday, Louis Pasture, and Johannes Kepler. And most importantly, this introduction presents a very clear gospel message. On Thursday November 19th, just a few days before the 150th anniversary of the book, fifty thousand copies of this special publication will be freely given out at those top fifty universities. Now think of it. In one day, the Gospel and clear presentation of intelligent design will be placed into the hands of fifty thousand of our future doctors lawyers and politicians. And we’re working with Campus Crusade for Christ, Answers in Genesis, and the Alliance Defense Fund to get copies of Darwin’s Origin of Species into the hands of this generation. And all we want to do is present the opposing and correct view, rather than being censored, which is exactly the case at present. These students aren’t stupid. They should be given both sides of the argument and allowed to make up their own minds, right? We think that’s healthy. There’s nothing to fear. Ray Comfort and I are going to a local university to give away one thousand free copies ourselves on November 19th and we’re very excited to do this. Listen, for instance, to UC Berkeley’s policy right here in California. Their own website says, “Anyone is free to distribute non-commercial materials in any outdoor area of the campus.” Besides, what are they really going to do? Ban the Origin of Species? That’d be big news, especially when their own bookstore sells it for $29.99. So get a hold of 100, or 500, or 1,000 copies for yourself or for your church and go to your university. We’ll give you a free poster and a clear and simple strategy. Go there as a team and get the gospel into the hands of this generation; the hands of future doctors, lawyers and politicians. Remember this is America. It’s still the land of the free, the home of the brave. And this is a life and death issue. We’ve had a number of requests from people asking if we could expand our giveaway from fifty to a hundred universities. If we want to be able to do that, we need to act quickly… have more books printed. Today we know of 130 yard sales that are being held across the country to raise money to try to make this happen. One millionaire has said he’ll match the biggest donation given to the project. Those that would like to help us reach that goal can get details on LivingWaters.com. Please be in prayer for us and thank you for listening.